Origami – the art of paper folding is a sculpting technique associated with Japanese culture. It is the transformation of flat paper sheets into a finished sculpture with intricate designs through folding. Origami in home décor can spice up any space. Just don’t restrict your ideology about thinking only the geometric patterns. There are lots more with origami to make it an uncommon stand out décor piece. Check out these beautiful ideas to decorate your slice of heaven. Wall hanging is the center of attraction that gives a visual treat to everyone who enters your home sweet home. The colorful ingenious breathtaking animal wall art is no doubt but an awesome décor piece. The geometric paper fold star wall art gels with any space and make it look amazing. These origami arts will stick to a stand out décor style. Are you getting bored with normal wall clocks? Then it’s time to switch to these fascinating wall décor clocks. The Karlsson origami wall clock, black and white geometric pattern wall clock would transform the style of your home completely. There are endless options to choose from, so pick your favourites to match your room themes. Light is the beauty of earth!! Earth is beautiful because of light!! Is it okay? Right? So let’s say light displays the beauty of earth. In the same way the pendant light, colourful lampshades would display the complete beauty of your décor. Origami lampshades are extremely stylish that makes your little world more bright and beautiful. Make your bedroom more special by filling your décor with pure love. The pretty flowers, snowflake ballerinas will make it look more lovelicious to impress your better half. These origami hearts will make even your wall to fall in love. 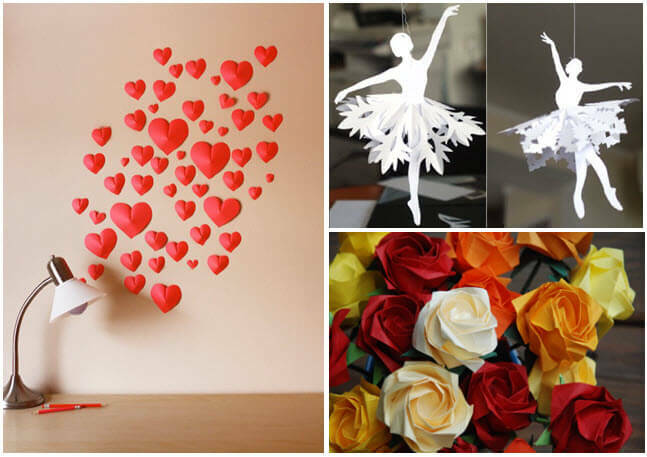 Feel the music of love in your favourite room with these origami decors. Delicious origami fruits on your dining table is a genius idea that would beat the fresh fruit display. Take a look at the elegant swan basket that is finely crafted to bring in life to the paper. The cute pinky candy box is a yummy friend for the fruits and other treats on the table. These centrepieces would make your dining special every time. Add true enchanting accent to your décor with origami wind chimes. The crane wind chime is a marvellous décor piece and the best gift for your loved one. 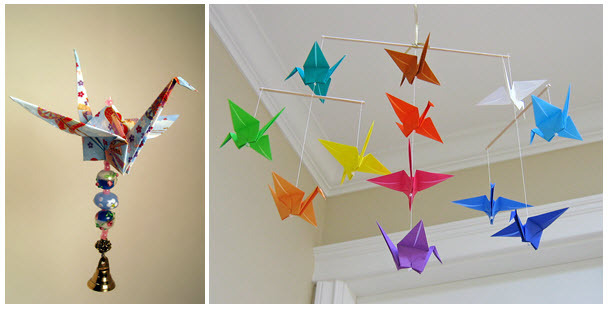 The mobile crane goes colourful and flashy for your modern baby room décor. No doubt your baby doll is gonna love it! 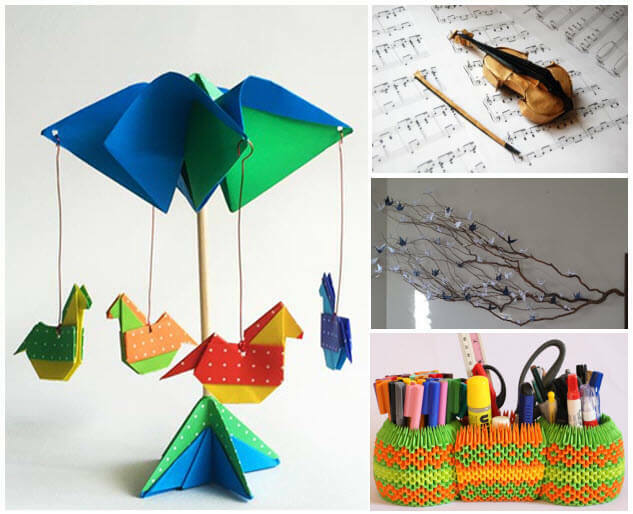 Other cute useful items include origami pen holders, origami carousel kiddy gift, origami musical violin and lots more to be listed. These pretty origami paper magic’s will make your décor look colourful and lively. The origami branch model is an outstanding décor for rustic themes. Create your own style of décor with origami. Origami Décor is an addition to your home interiors. Try 3d Origami, Origami flowers, Origami Bird, Origami rose and much more. 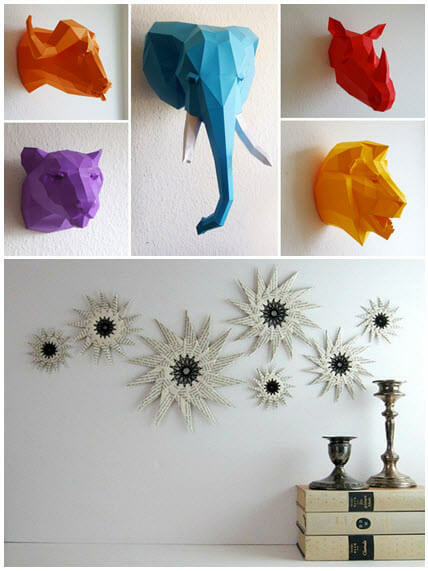 If you are looking for a colourful way to decorate your home, then just choose origami decors. It is creative, cute and a great way to save money on décor. The peppy colors of the décor will be loved by everyone at home. 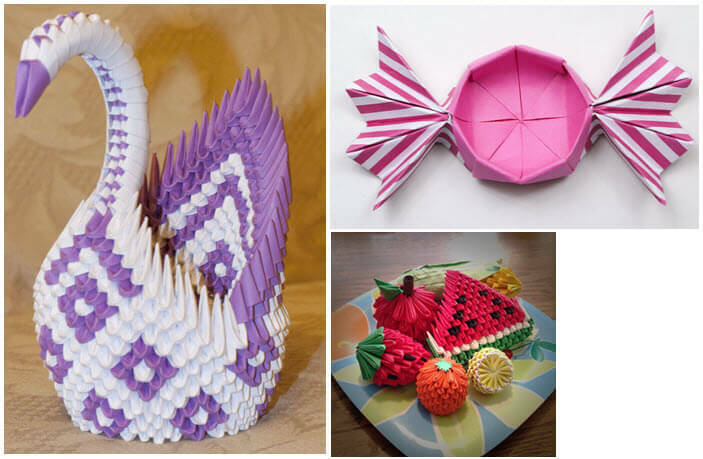 Get ready to decorate your sweet home with these splashy fun filled origami decors. New ideas and unique pics regarding the décor is always welcome from your side. ENJOY EVERY FOLD OF THE DÉCOR….